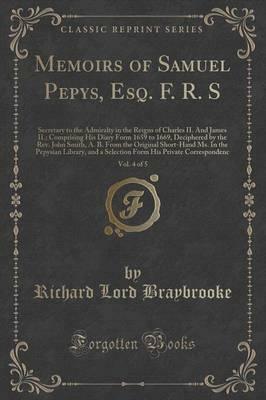 Excerpt from Memoirs of Samuel Pepys, Esq. F. R. S, Vol. 4 of 5: Secretary to the Admiralty in the Reigns of Charles II. And James II. ; Comprising His Diary Form 1659 to 1669, Deciphered by the Rev. John Smith, A. B. From the Original Short-Hand Ms. In the Pepysian Library, and a Selection Form His Private Corresponden It is a pleasant period for illustration of the charac ter of Pepys himself. Mrs. Pepys has gone into the country to stay with old Mr. Pepys, and young Mr. Pepys - now thirty-six years old - is hanging out the broom. He works hard in his office as he always does, but he goes also to plays very freely, sings with his friends in arbours at Vauxhall, so that much company crowds round to hear them, and he has little dinners and little suppers at home to which also Knipp comes when there is no wife there to be jealous. And Mrs. Pepys meanwhile has little joy in the country, for her. About the Publisher Forgotten Books publishes hundreds of thousands of rare and classic books. Find more at www.forgottenbooks.com This book is a reproduction of an important historical work. Forgotten Books uses state-of-the-art technology to digitally reconstruct the work, preserving the original format whilst repairing imperfections present in the aged copy. In rare cases, an imperfection in the original, such as a blemish or missing page, may be replicated in our edition. We do, however, repair the vast majority of imperfections successfully; any imperfections that remain are intentionally left to preserve the state of such historical works.